1. Friendship bracelets go chic - these Dezso by Sara Beltrain bracelets are woven in bright colors and adorned with silver charms such as shells or sharks teeth - perfect for summer surf style! 2. I've always been a sucker for lighting and Furbish Studio has plenty of lust worthy option. I particularly love this beaded and hemp covered Turks Chandelier. Can't you just see it in a luxe beach cottage?! 4. Summer beauty is all about looking natural and fresh. YSL's Volupte Shine feels amazing on lips and adds just the right amount of colors. I recently started using AmorePacific CC Cream which comes in a compact for application on a go, is great for sensitive skin and has SPF 50 to protect from the sun. For nails, the brighter better! Try a coral shade like Essie Geranium for some color pop. 5. 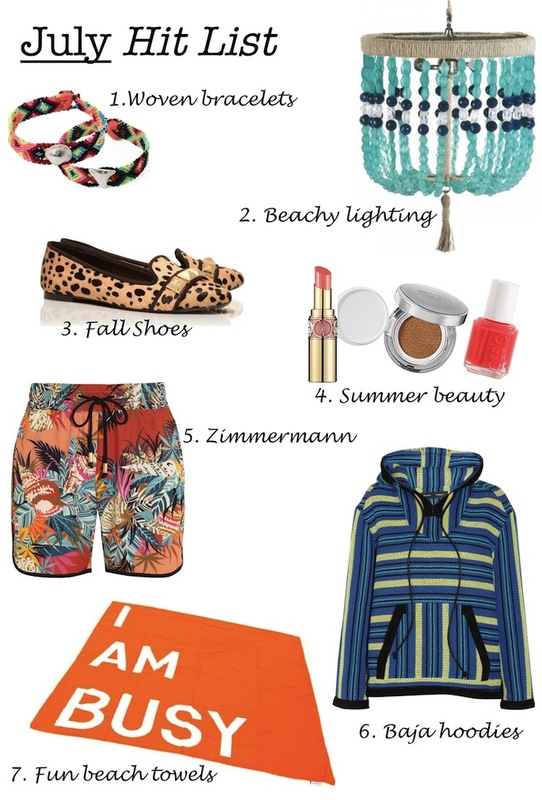 Zimmermann's print perfect board shorts and rompers make perfect beach wear for those of us that want a little more coverage. 6. I grew up spending warm summer nights at bonfires on the beach and Baja Hoodies were practically a prerequisite for attendance. Although I'm obsessing over this Proenza Schouler baja sweater here is a great budget friendly option. Gorgeous, gorgeous, gorgeous! I am obsessed with that beach lighting - so cute. Lovely collection, I adore those TB flats. Love your picks, Chelsea! I love the beach towel, so cute.